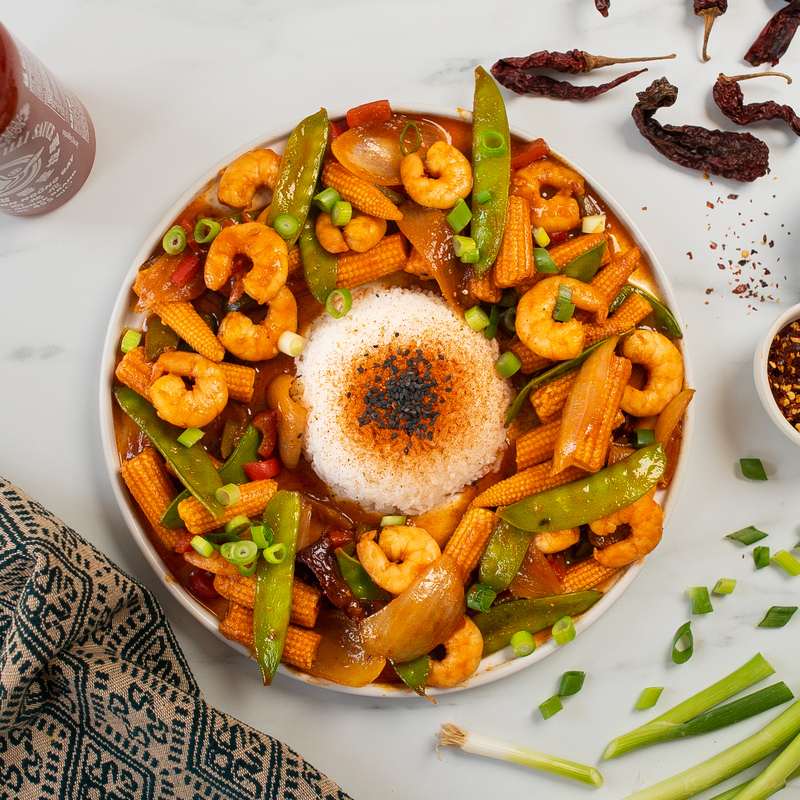 For years I loved visiting Wagamama for their spicy prawn firecracker rice! It tasted amazing and I used to have it pretty regularly… until I found out that they started to put alcohol in it *cries*! I was definitely heartbroken and have been trying to whip up my own version ever since! I’m pretty chuffed with my recipe and thought that any ex-wagamama lovers would love it too! 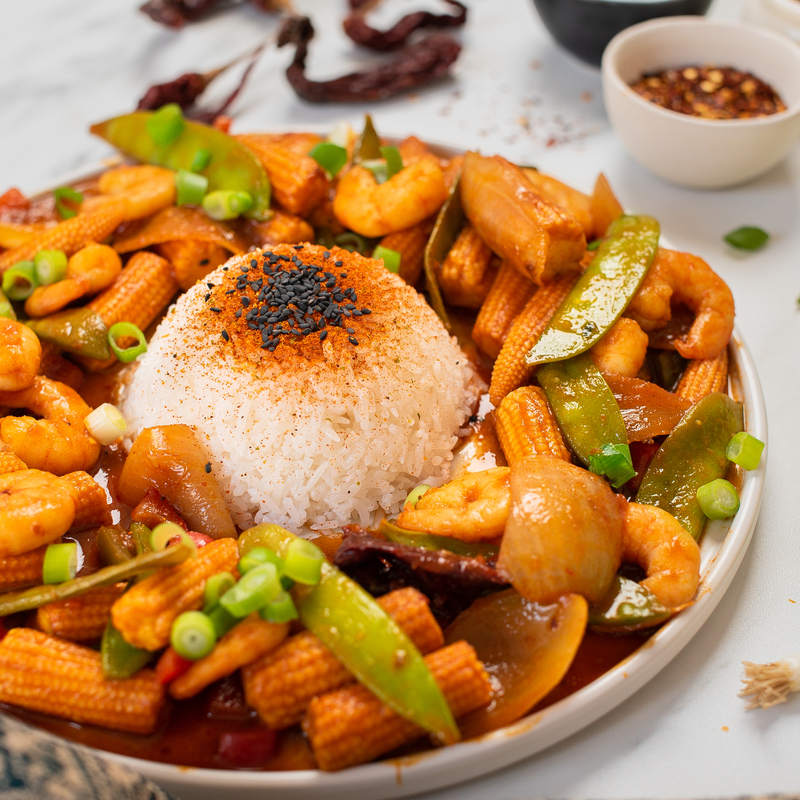 A delicious, super spicy prawn stir-fry served with rice. Begin by adding the chilli oil to a pan over a medium to high heat. Add in the dried chillis and leave for about a minute or two to allow the flavour to infuse into the oil. Add in the onion and ginger garlic paste and stir well. Once the onions have lightly browned, add in the red pepper, sweetcorn, mangetout, salt and chilli flakes. Mix well for a few minutes. Next, add the soy sauce, sriracha sauce and vinegar and stir until everything is well combined. Add the cooked prawns and stir for a couple more minutes. Finally, serve with sticky rice and garnish with spring onion, shichimi powder and black sesame seeds. Tip - use a small bowl to mould the sticky rice to get a dome shape.